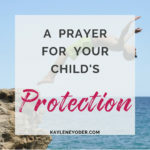 Father, I thank You for the promises You give throughout the Bible to keep Your children safe. To give us a refuge, to be our strength and strengthener. Thank You that You will never leave us nor forsake us and to be gracious to us all the days of our lives. 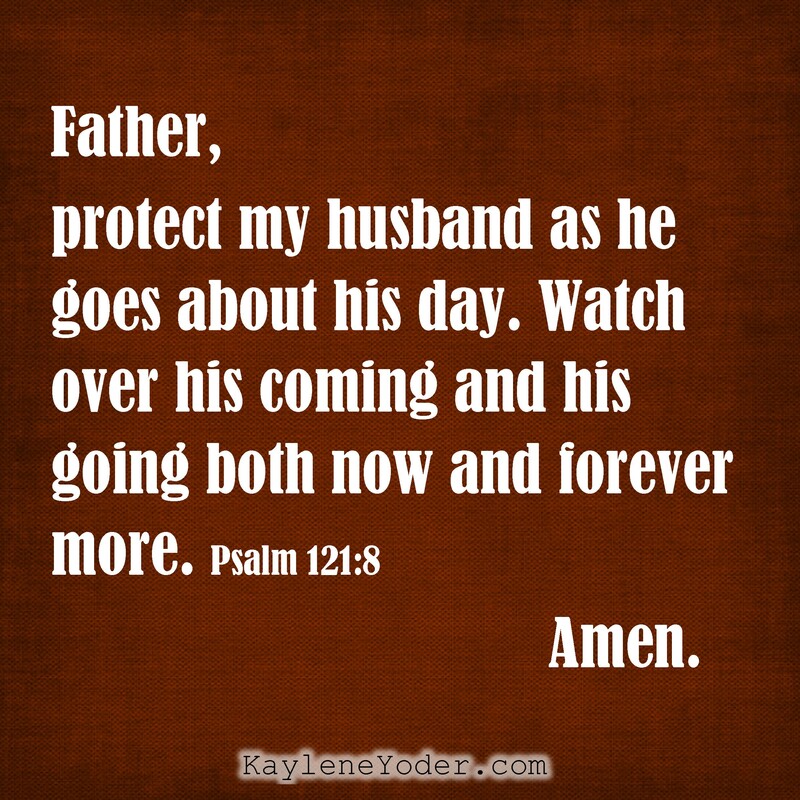 Father, protect my husband in all the ways he walks; watch over his coming and going (Ps.121:8) guiding him away from any harmful situations. 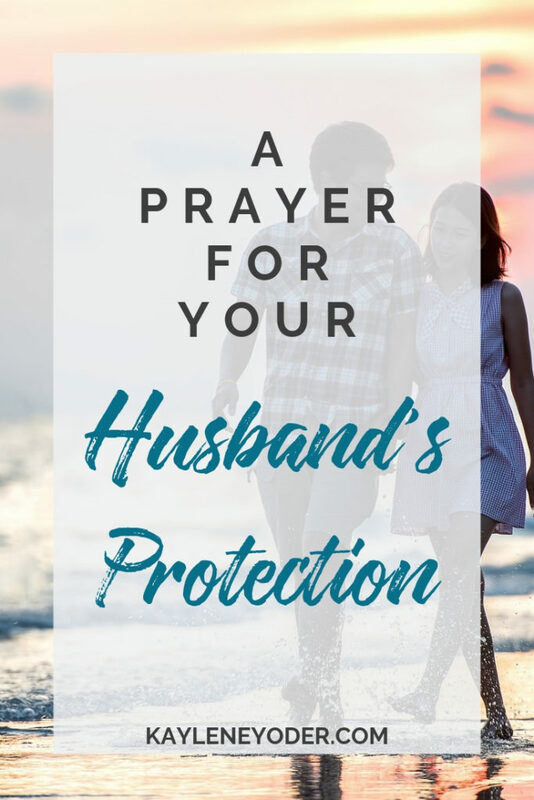 Protect him from traveling accidents, work accidents, sicknesses, debilitating diseases of the body or mind. Protect him from violence and the people who do it. 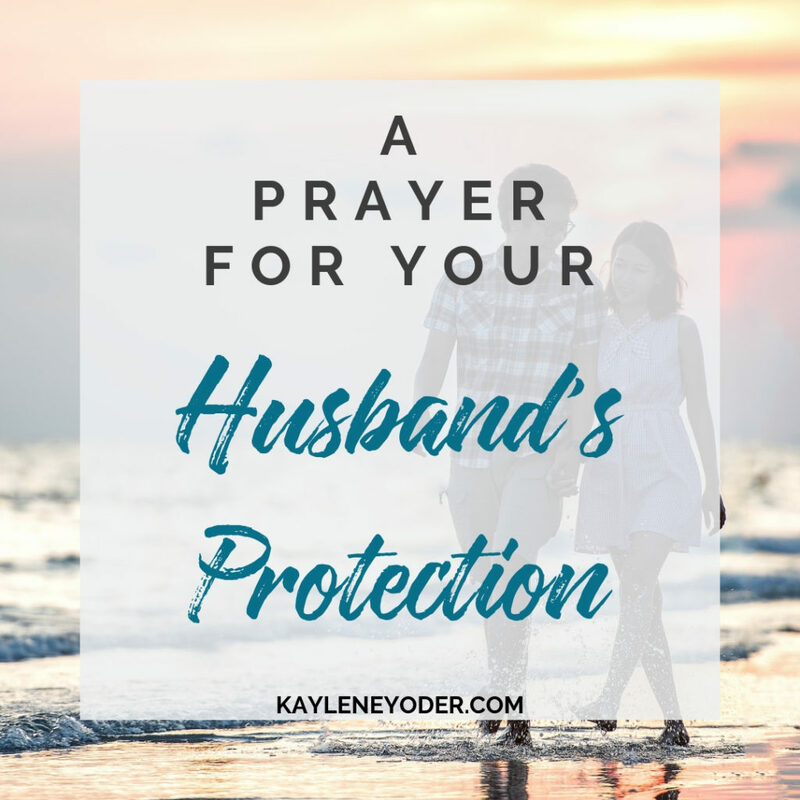 I stand in the gap on behalf of my husband, (Ez.22:30-31) asking that You place your mighty hand of protection around him in every way he goes. Father, when his heart is burdened and his spirit weary, the world seems dark all around, remind him that You are his shield, his deliverer, his rock. Remind him that You are his firm foundation, cornerstone and stronghold. (2Sam.22:1-4) Protect him from any attacks the enemy plans to make on his mind, diverting the fiery darts that get sent his way. You will not fail him, for You will not reject your people; You will never forsake Your inheritance. (Ps. 94:14) In Jesus’ precious name. Amen. Just lovely! 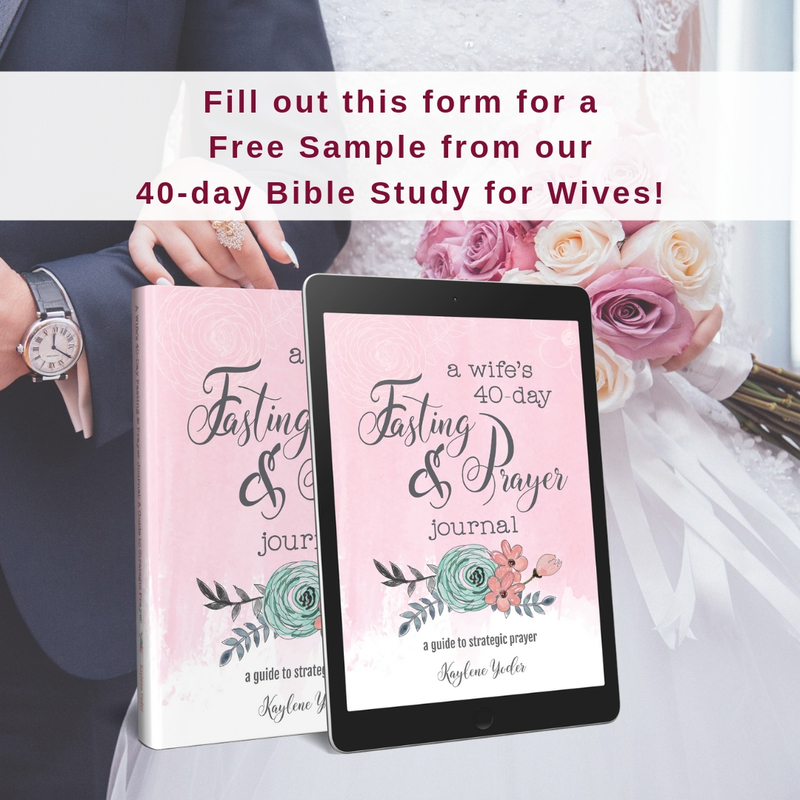 I love praying scripture, and praying faithfully for your husband is such a wonderful thing!<br /><br />Thanks for joining Grace at Home! 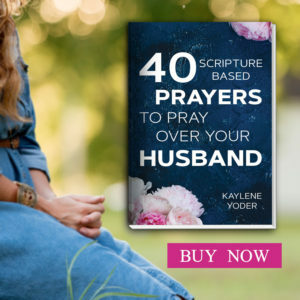 I just found your blog, and have been reading through some of your prayers for husbands. 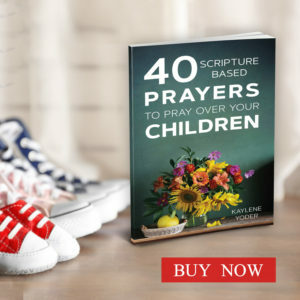 Great reminder, as my children&#39;s needs tend to monopolize my prayers. Good stuff, thanks! Hello, Jamie! So glad to have you visit! 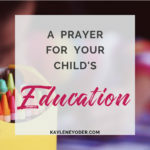 My prayers, too, seem to be dominated by my children&#39;s needs. 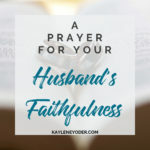 I trust your husband will be blessed by you praying for him! Blessings! Have I mentioned that I just love what you are doing here? Seriously. 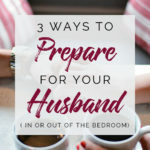 Your focus on marriage and fulfilling the role as a Godly wife always encourages me. Thanks for that. <br /><br />And thanks for linking up with #EverydayJesus. Blesisngs, dearest Kaylene. Beautiful! 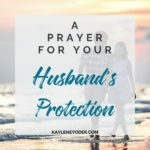 My husband is a police officer so I pray for his protection and safety often. 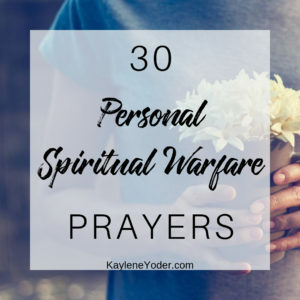 I will be checking out some of your other prayers,too. 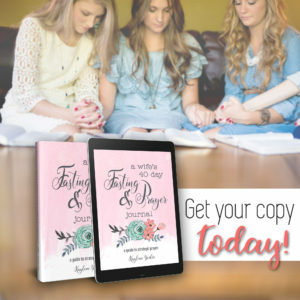 I host the Saturday Soiree Blog Party at http://faithalongtheway.com and I would be honored if you would stop by and share some of your heart with my readers! Thank you and I am glad to have found you through Cornerstone Confessions. Just wonderful!!! 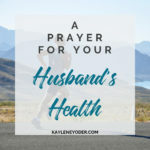 praying for my husband, myself and loved ones. Thank you, Kaylene, for sharing this beautiful prayer with us. 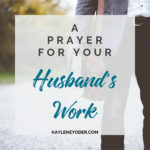 Imagine what the world would be like if all wives prayed this prayer daily for their husbands. 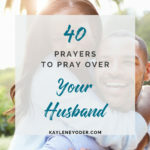 May God protect you and your family .Please continue to encourage wifes and mothers to pray for your love ones.We need God in every person to change this world ,we need love . Thanks for your time to listen God and help others. One of my church sister gave me your book (40 Prayers to Pray over your Children) as a baby shower gift, and I can honestly say it was the best thing anyone has ever given me. 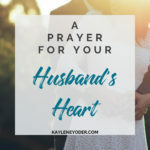 I went on your website and I was even more bless with the prayers to pray for myself and over my Husband. You are a blessing and I want to thank you for your extraordinary work. Thank you for your kind words, Dorane. It is truly a pleasure to serve our Heavenly Father alongside you. Many blessings to you! 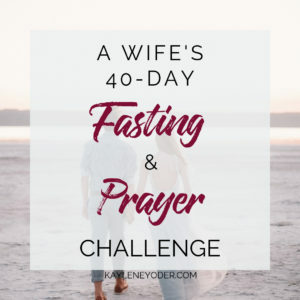 Rhea, yes, you may share a link to this prayer on Facebook. God bless! Amen! I am overjoyed that I found your website today. You are a blessing and inspiration. 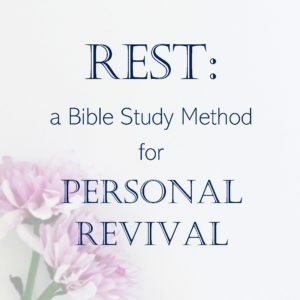 I feel a fire kindled in my soul to go deeper in His Word and my personal prayer life. Thank you and God bless you and yours!